The Aero PowerMount allows you to mount power strips and surge protectors to poles, tripod legs, tables, and more using common grip gear. This solution enables photographers, videographers, and creatives to create an organized, safe, and efficient workstation. The Aero PowerMount features a female 1/4″-20 thread and 5/8″ baby stud with an anti-rotation flat to ensure a secure connection. The Aero Power Strip provides easy access to clean and safe power. The 6-outlet surge protector/power strip fits securely under the Tether Table and will be there when you need it to power a laptop computer or recharge camera batteries. This solution enables photographers, videographers, and creatives to create an organized, safe, and efficient workstation. Works with any surge protector or power strip that has mounting holes on the back of the strip. 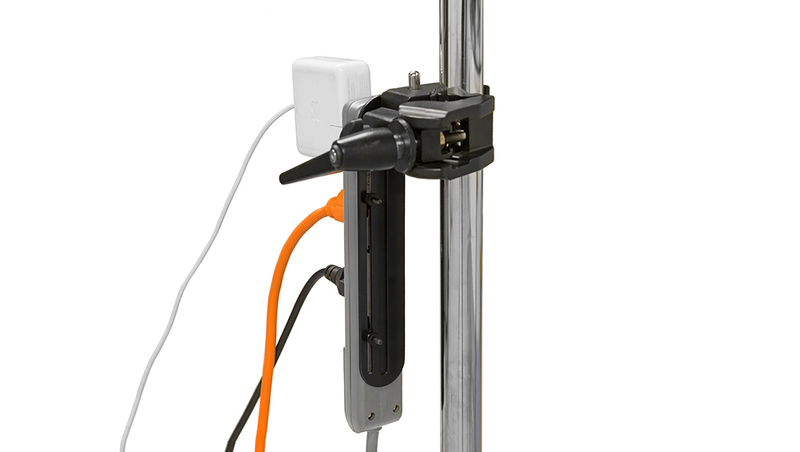 Use the Aero PowerMount to secure power strips and surge protectors to: poles, tripod legs, video carts, tables, workbenches, trusses, and more. The Aero PowerMount features a female 1/4″-20 thread and 5/8″ baby stud with an anti-rotation flat to ensure a secure connection. Combine with any grip gear that has a male 1/4″-20 thread or female baby stud receptor like a Master Clamp, EasyGrip, or VersaClamp. In this setup, we’ve moved our surge protector off the ground and made it portable. The surge protector is mounted to the Rock Solid Low Boy Roller via the Aero PowerMount and a Rock Solid Master Clamp.